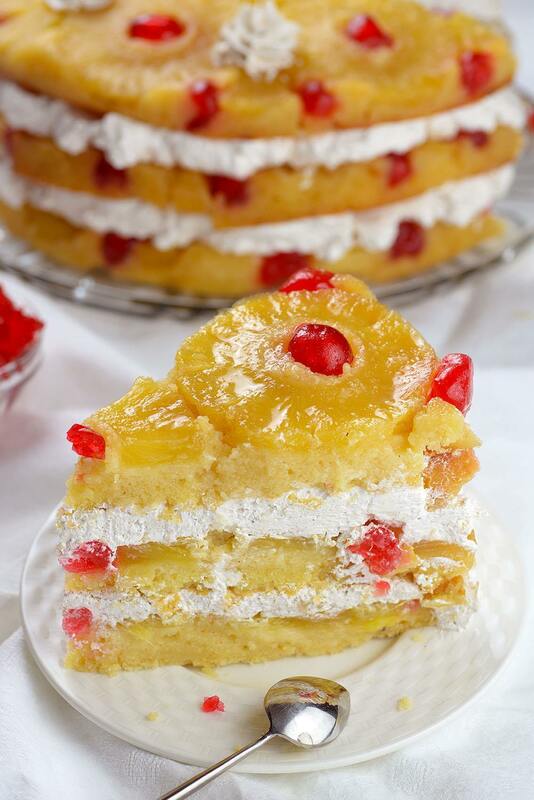 Pineapple Upside Down Cake – triple dose of old-fashioned, buttery, brown sugared, melt-in your-mouth pineapple upside-down cake layered with sweet, pillowy homemade cinnamon-vanilla whipped cream. Bonus: no mixer required for the cake recipe (just for the whipped cream). Triple the glaze and triple the fruit and you’ve got a whole new world of awesome!!! This is the kind of show-stopping cake you want to bake for guests, friends and family. This super moist and full of flavor cake has three layers of caramelized pineapple and maraschino cherries with buttery brown sugar juicy glaze, and that’s the best part of every pineapple upside-down cake, right?! When I saw this cake at A Latte Food I became totally obsessed with it. It took the finest part of the entire Pineapple Upside Down Cake and tripled it in every single bite, plus there’s light and fluffy whipped cream full of delicious cinnamon flavor. It seems like a dream come true, so I had to try it. Don’t get me wrong, I like the old –fashioned pineapple upside down cake, with thick cake part full of brown sugar and vanilla flavor (check out this delicious Magic Custard Cake recipe if you’re into the vanilla flavor) and the buttery, browned sugar juicy topping dripping on all sides of the cake, but this way I could get a lot more of my favorite part. Three layers of pure deliciousness sound so much better than one layer!!! 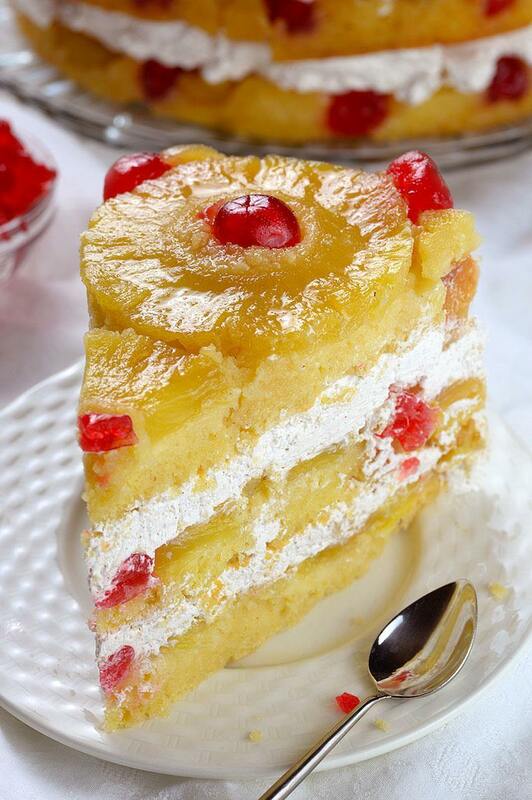 If you ever baked Pineapple Upside Down Cake than you know as the cake bakes, the buttery brown sugar sauce bubble up the sides, creating a buttery glaze on all sides of the cake. And it’s absolutely the best part! So you can imagine how juicy, moist and buttery this cake will be when the cake batter part and the glaze part are in a different ratio, in favor of the glaze of course. For a cake base I use my own vanilla cake recipe with melted butter. I love this recipe because there’s no mixer required. There’s no need to mixing the butter and sugar, adding the ingredients one by one…Just whisk by hand melted butter and sugars, add wet ingredients whisk a little, add dry ingredients whisk to combine, pour the batter in the pan and you’re done. Since I don’t have three round cake pans and I had to wait for every layer to bake to use the pan again, I made the batter in three parts. It might sounds as a lot of work but every part of the batter is done in a few minutes and you don’t even need to clean the bowl in between. It’s a little time consuming waiting for 30 minutes to use the pan again, but if you have three 9 inch round cake pans you will finished these cake really quick and easy. 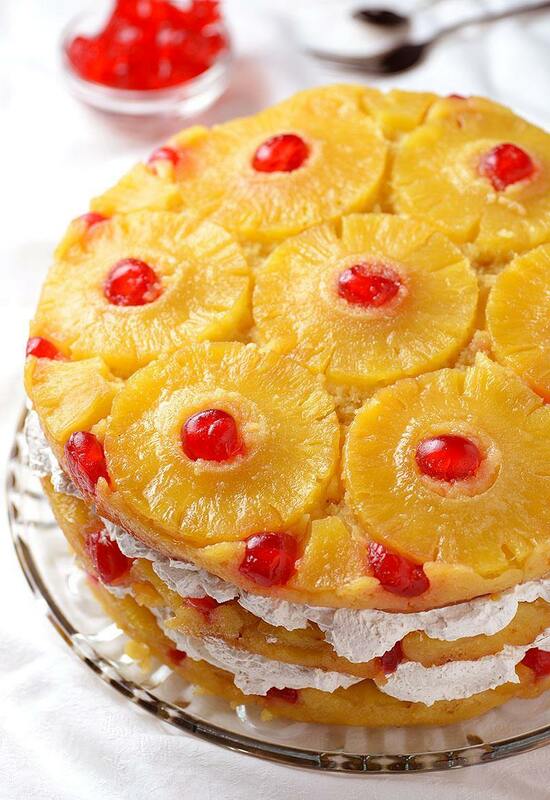 This luscious springtime Pineapple Upside Down Cake will become your favorite instead of standard Pineapple Upside Down Cake recipe. In a large microwave-safe bowl, melt butter in the microwave, whisk in the sugars – mixture will be gritty. Whisk in egg, yogurt, milk, pineapple juice, and vanilla extract until combined. Slowly whisk in dry ingredients until no lumps remain. Gently pour/spoon batter into prepared pans and smooth the top. Bake 30 minutes (until toothpick inserted in the center comes out clean). Invert first layer on a large serving plate and the other two on a parchment paper to cool completely. Oh my god. It looks so yummy. Question regarding the section about you making each layer of the cake separately (because you only have one cake pan): Does that mean you divided each listed ingredient by 3 to make each layer separately? Are the listed ingredient measurements based on making all 3 layers at once? Hi Chantelle, the listed ingredients are for all 3 layers at once. of waiting and using the same pan. I have done this for a banana cake. 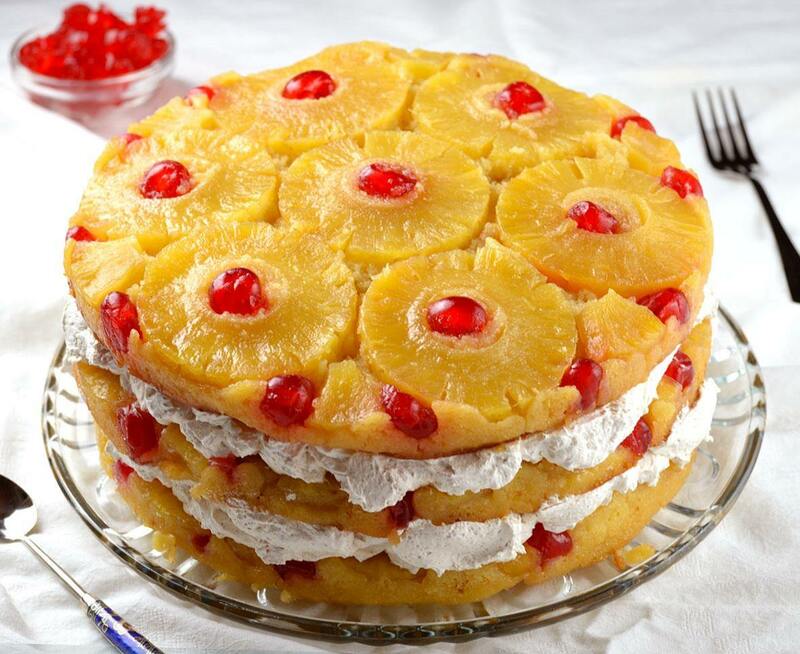 Hi Janet, you cant do this for this recipe because every layer should have the pineapple at the bottom of the pan. Hi, thank you for sharing, it looks really yummy! I found online that 1 C of AP Flour equals approx. 128g, while in your recipe it says 2 1/4 C = 210g (according to my online search, 2 1/4 C should equal 288g, which is quite a big difference). Which number should I follow more strictly in the recipe for the flour – is it the measure for the Cups or for the Grams? Hi Edgar, measure in grams if you have a scale. If you sift the flour and using the spoon scoop the flour into the cup you shouldn’t get more than 210 grams in 2 1/4 cups. Do not pack the flour down and do not tap the measuring cup. After you’ve spooned the flour into the measuring cup, use the back of a knife to level off the top of the measuring cup. Is the cake recipe part for all 3 cakes or just 1, then repeat for each cake? it’s for all 3 cakes. Hello, I made this and the cake was very dense and didn’t seem like what I was expecting, is it supposed to be like that? I like the idea of the three layers and the whip cream went nicely with it, just thinking I would use a different cake recipe? Hi Vera…. Our cake turned out dense… so not sure what went wrong. On the topping… it says butter, brown sugar and 3 cans of pineapple slices. How much pineapple juice do we add to the topping? It doesn’t say anything about the topping in the directions. Hi Bunco, juice doesn’t go to topping. I’m sorry you didn’t like the cake . Hi! Love this recipe. It’s awesome, but I have a question….. What can you do for your cake not to come out dense? I just made these cake exactly to the letter of this recipe checked everything 3x as I was making it. the cake does come out dense and I also noticed that there doesnt seem to be quite enuff batter to spread all over 3 cake pans. I did get enuff but they are very thin. Dont seem very moist. I will let you know when it cools and i try it. It smells really good. looks pretty good. just thin and the batter was dense. So we will see. just something doesnt seem right. the cakes are dense. Maybe using more than one box of mix . What do you think? I would love to make this, sounds great but I don’t bake much, maybe a yellow cake mix would work. I was wondering if there was an alternative to the Greek yogurt? My grandma requested a pineapple upside down cake for her birthday. The only issue is that she and my sister can’t have yogurt. This recipe looks so delicious and LOVE the idea of layers. Thank you so much for sharing! I can’t wait to make this recipe! Before I do I have one quick question. Can I use premade cake flour? If so, should I use 2 1/4 cups plus 3 tablespoons? Thanks so much! Hi Jessica,yes, that’s correct,if using cake four omit the cornstarch and substitute with flour. Just made this cake for a thanksgiving dinner. I was very disappointented in the taste. It was awful. I followed the directions to a T. There was not enough batter to cover each pan. I did make my filling differently which was the best part of the cake and because I put it in the middle of this it ruined the filling cause the cake was horrible. I wouldn’t recommend this recipe to any one. I have never read a recipe that calls for as much corn starch and baking powder as this recipe does. May want to check your ingredients and amount to make sure its correct.